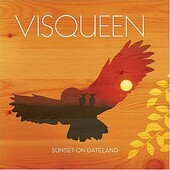 On their second full-length, Sunset On Dateland, Seattle power-pop/post-punk outfit Visqueen deliver the fast-paced rock and sugary melodies that their debut, King Me, so easily offered up. However, Sunset On Date offers much more than the one-dimensional debut. Whereas nearly everything on the debut was sugary, tightly produced, and straight ahead, Sunset On Dateland takes a more easy going approach, allowing the songs to breathe more, complete with a looser, more fly-by-the-seat-of-the-pants approach, as album opener "Look Alive" demonstrates. "Look Alive" could have been on King Me, though instead of a polished, pop-punk feel, Visqueen gives the song a rougher texture, making it have more in common with a bash 'n' pop garage rock band than a Southern California pop-punk fly-by-night act. Fast and energetic, the song excels with more breathing room, the band hammering it out with the rawness of a band in their garage, playing for nobody but them, and having a ball doing it. Much more akin to their live show than their previous studio record, "Look Alive" signals that Sunset On Dateland is what you want, a record that nears their live show, without sacrificing quality. "Friends In Love" and "Buttercup" recall the early 90s post-punk explosion that helps change the face of commercial rock at the time and, more importantly, the face of music. While "Beauty Deluxe" is the sugary, yet screaming punk that quickly established Visqueen in the Northwest and beyond as a powerful rock force to reckon with. "Crush On Radio" has long been one of my live-show favorites and I'm glad it made its way onto Sunset On Dateland. A powerful mix of energetic, straight ahead guitar rock and power-pop sensibilities, this song will reel you in, front woman Rachel Flotard's vocals sound full of love and life when singing "I got a crush on you", regarding her CD collection and her stereo. Closing out with "Houston", Visqueen once again extend their wings and challenge themselves, to stellar results, offering up a slow burning, guitar-laden soundscape on top of light percussion, Flotard's vocals the driving force in this mellow (for Visqueen) number. Still rocking, but in a different way, this slightly psychedelic piece the sound of the candle burning out, as the album ends. It leaves you scrambling for the repeat button to hear it all again. Whereas King Me may have pigeonholed the band, Sunset on Dateland breaks the mold and offers up many dimensions to this guitar-driven, power-pop guided guitar rock band that can do it all, and still make you smile, bounce, and sing along. I'll give it an A.